FSU Football Home Opener Vs. NC State, Sept. 23: Buy Tickets Today! TALLAHASSEE, Fla. – Part safety, part “star” nickel back and part edge-rusher, Florida State’s Derwin James is widely regarded as the most versatile player in the country. North Carolina State tight end Jaylen Samuels might not be too far behind. Like James, Samuels has an official position on the depth chart, but to simply call him a tight end or a fullback or an H-back – he’s been listed as all three throughout his career – doesn’t come close to describing what he does. A 5-11, 227-pound senior from Charlotte, N.C., Samuels regularly plays at running back, receiver or tight end and seems to do them all equally well. He can even throw passes, as he did last year with a 59-yard halfback pass that went for a touchdown. (Samuel’s final 2016 passing line: 1 for 1, 59 yards, 1 TD and a QB rating of 925.6). Samuels so defies categorization that the ACC this summer debuted a new position for its preseason All-conference team: all-purpose back. No surprise that Samuels garnered nearly 75 percent of the vote. As a result, the chess match between Samuels and James – and, by extension, between NC State coach Dave Doeren and FSU defensive coordinator Charles Kelly – is one of the more compelling aspects of Saturday’s matchup between the Seminoles and Wolfpack (noon, ABC). For James, the matchup is a bit like looking into a mirror. Through three games, Samuels leads the Wolfpack (2-1) in catches (26), receiving touchdowns (2) and rushing touchdowns (3), and he’s threatening the school’s all-time rushing and receiving records. “Obviously for ‘Jay-Sam,’ you’d love to see him having the ball in his hands as many times as you can,” NC State coach Dave Doeren said. Florida State, meanwhile, loves to see James near the ball as often as possible. 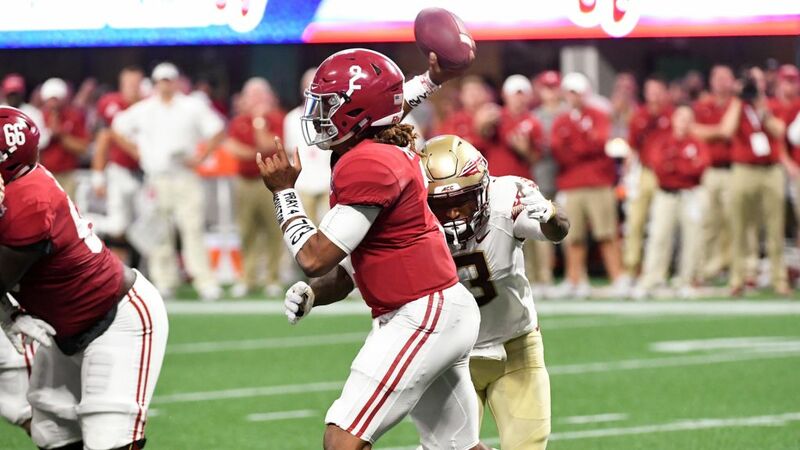 In his return to action following a knee injury, James was right back at it, moving all over the field while helping FSU’s defense limit Alabama to just 269 yards of total offense in the season opener. He logged six tackles and 0.5 sacks, which brought his career totals to 108 tackles, five sacks, two forced fumbles and an interception. And if that doesn’t yet qualify as a “little bit of everything,” consider that James has yet to return his first kickoff, something that could change as soon as Saturday. Fisher smiled when told that James saw similarities between himself and Samuels. “That’s a great analogy. It really is,” Fisher said. “That shows you how aware (James is). Why you like Derwin so much as a player, and why he’s so good, is because he can recognize other people who see the game. Several of Florida State’s defenders echoed those sentiments. NC State, of course, has other offensive weapons besides Samuels, including veteran quarterback Ryan Finley and running back Nyheim Hines, a former receiver who caught 11 passes for 124 yards against the Seminoles a year ago. And slowing down Samuels doesn’t fall only on James’ shoulders. Still, FSU’s best defender plans to keep close tabs on him come Saturday.